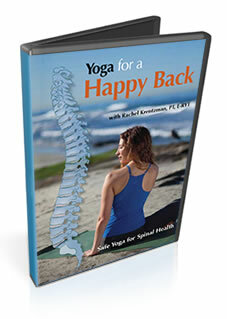 This series of therapeutic sequences is designed specifically for people with back pain, degenerative disc disease, spinal stenosis, scoliosis, upper back and neck tension, sciatica or other back issues. Rachel Krentzman, PT, E-RYT combines 16 years of physical therapy experience with more than 10 years of Yoga studies. Her treatment methods involve a highly effective approach to healing the whole person. Rachel received her 2000-hour certification from the College of Purna Yoga TM and has studied Yoga therapeutics. She is the founder and director of Embody Physical Therapy and Yoga in San Diego, CA. Cost: $19.99 plus tax and shipping and handling. For your protection payments are processed by Paypal.com™ The safest way to shop online.